Also serving communities of Moundsville. There are 7 Assisted Living Facilities in the Wheeling area, with 3 in Wheeling and 4 nearby. To help you with your search, browse the 9 reviews below for assisted living facilities in Wheeling. On average, consumers rate assisted living in Wheeling 4.5 out of 5 stars. Better rated regions include Follansbee with an average rating of 5.0 out of 5 stars. Caring.com has helped thousands of families find high-quality senior care. To speak with one of our Family Advisors about assisted living options and costs in Wheeling, call (855) 863-8283. The picturesque scenery from the Appalachian Mountains and Ohio River banks makes historic Wheeling a relaxing destination for locals and visitors alike. Wheeling seniors have the choice of three assisted living facilities within city limits, plus eight additional assisted living facilities in nearby Ohio. The Office of Health Facility Licensure and Certification from the West Virginia Department of Health and Human Services governs Wheeling assisted living facilities, while the Ohio Department of Health handles assisted living communities in Ohio. These organizations monitor assisted living providers so employees provide appropriate care in safe, clean facilities. Seniors who dislike snow may not want to venture out much during Wheeling winters, as snowflakes often dot the ground from December to March. The city averages 18 inches of annual snowfall. Wheeling also experiences 40 inches of rainfall per year, so seniors can benefit from rain boots and an umbrella. Throughout the year, temperatures typically range from 23 to 83, but occasionally they hit single digits or soar to the 90s. Clocking in at 88.6 on a 100-point scale, Wheeling has a higher cost of living than West Virginia but a lower cost of living than the U.S. average. Grocery and transportation costs both exceed the national average, which is not uncommon for a tourist-friendly town. Crime is a potential issue in Wheeling, as 86 percent of U.S. cities are safer than this riverfront town. The majority of crimes involve nonviolent offenses, such as acts of arson, burglary and vehicular theft, but residents still have a 1 in 102 chance of experiencing a violent crime. The Wheeling area is home to world-class medical facilities, including Wheeling Hospital and Ohio Valley Medical Center, in the event of medical emergencies or illness. West Virginia generally receives high rankings for air quality. Seniors can breathe confidently in Wheeling knowing that Marshall County scored an "A" for particle pollution from the American Lung Association. Other West Virginia counties, including Cabell and Hancock, received the same grade as Wheeling. Wheeling residents without vehicles use public transportation from the Eastern Ohio Regional Transit Authority and the Ohio Valley Regional Transportation Authority. Seniors age 65 and older pay a discounted fare of just $0.65 per ride. Assisted Living costs in Wheeling start around $0 per month on average, while the nationwide average cost of assisted living is $4,000 per month, according to the latest figures from Genworth’s Cost of Care Survey. It’s important to note that assisted living rates in Wheeling and the surrounding suburbs can vary widely based on factors such as location, the level of care needed, apartment size and the types of amenities offered at each community. 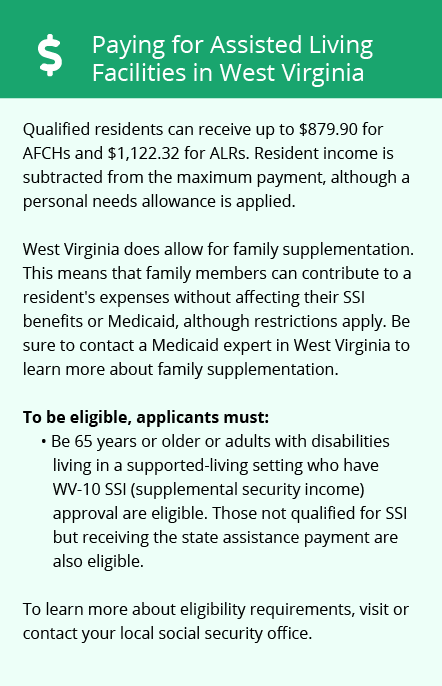 The Medicaid Personal Care program helps seniors cover expenses associated with assisted living facilities in Wheeling, West Virginia. Participants have the option to receive services in their own homes or at assisted living communities. Wheeling West and the surrounding area are home to numerous government agencies and non-profit organizations offering help for seniors searching for or currently residing in an assisted living community. These organizations can also provide assistance in a number of other eldercare services such as geriatric care management, elder law advice, estate planning, finding home care and health and wellness programs. To see a list of free assisted living resources in Wheeling West, please visit our Assisted Living in West Virginia page. 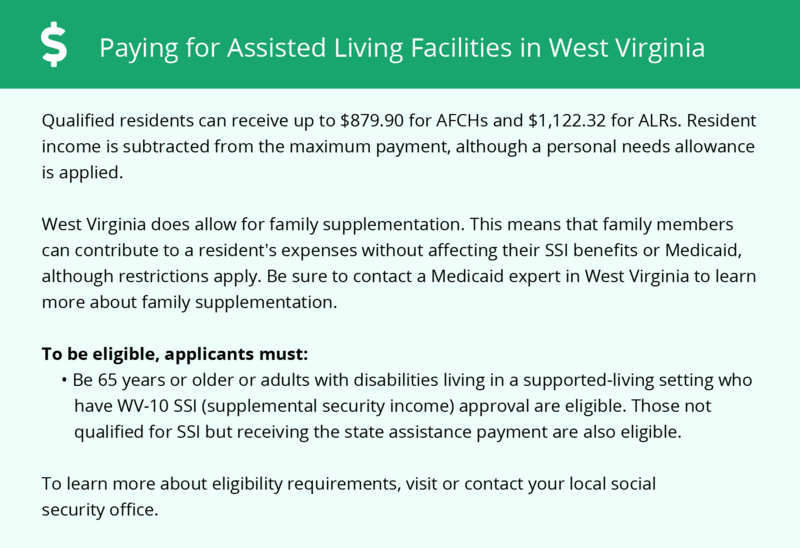 Wheeling West-area assisted living communities must adhere to the comprehensive set of state laws and regulations that all assisted living communities in West Virginia are required to follow. Visit our Assisted Living in West Virginia page for more information about these laws.